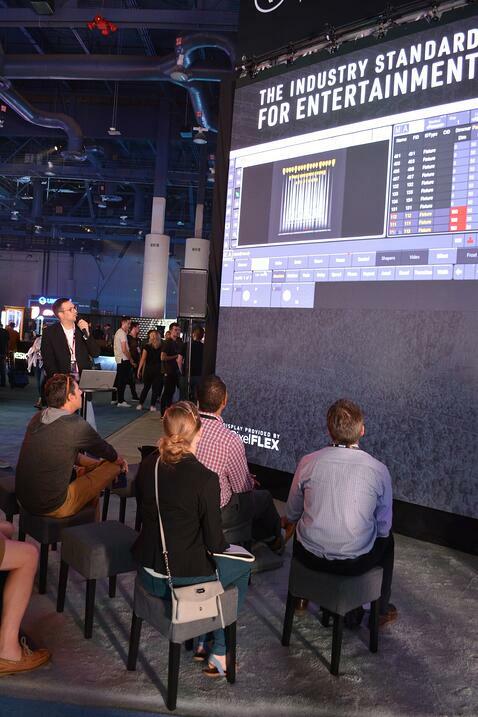 While there were many notable activities at the Vectorworks booth, like presentations on Vectorworks 2019, Braceworks, and Vision, the General Device Type Format (GDTF) press conference stole the show. The LDI booth was not only packed with press, but also with attendees that were curious about the new developments. To rewind a little if you’re still getting up to speed on the GDTF, in March we announced our partnership with MA Lighting and Robe lighting to bring to the industry a new open-standard format known as the GDTF. In April, we first introduced the GDTF to the public at our press conference during Prolight + Sound 2018 in Frankfurt. With the help of our founding partners, in September we introduced the first working version of My Virtual Rig (MVR), an open-file-format container that packages the GDTF files for all of the lighting fixtures in your design, along with a complete 3D model and data describing the positions and 3D elements. This allows you to easily conduct your previz with applications such as Vision and communicate directly from your Vectorworks design to your console. The GDTF format is currently supported by the grandMA3 console and will be supported by more than 20 of the largest lighting manufacturers in the near future. 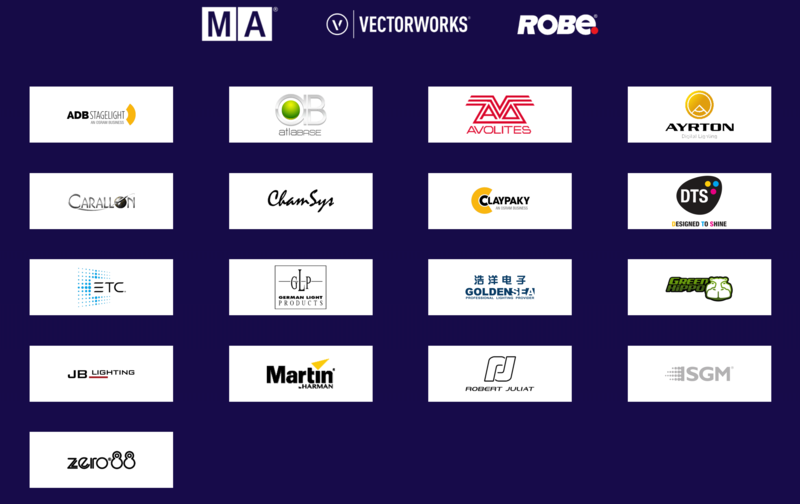 The brands currently committed to the GDTF. During the press conference, René Berhorst, head of product management of MA Lighting International, shared the latest announcements about the file format, along with a demonstration of the continually improving workflow between Vectorworks, Vision, and grandMA3 — thanks to the GDTF and MVR. He explained how a GDTF file contains information required for all phases of show development including: planning, patching, pre-programming, live programming, and the final show. For the first time ever, Berhorst shared what the new Fixture Builder will look like. The Fixture Builder will be available on GDTF-share.com later this year for manufacturers and end users to build files using an intuitive web interface. Additionally, a web-based forum will be added to the website later this year. The forum will be a way to facilitate more dialog about GDTF and MVR amongst users and companies. René Berhorst, head of product management of MA Lighting, presenting during the GDTF press conference at LDI. Following the press conference, Vectorworks’ CEO Dr. Biplab Sarkar and Senior Marketing Director Jeremy Powell, MA Lighting Managing Director Gerhard Krude, and Robe lighting CEO Josef Valchar joined Berhorst to field questions from press and attendees. 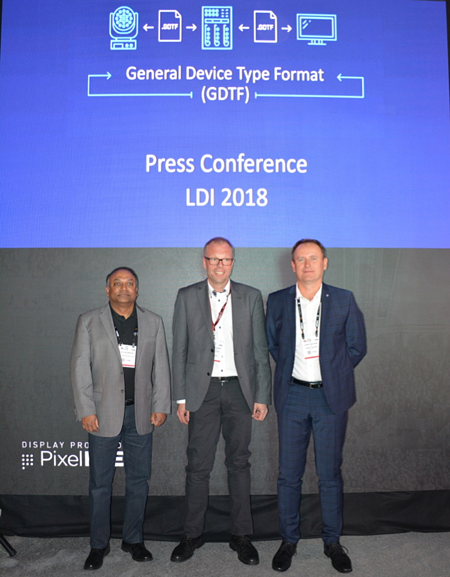 Vectorworks CEO Dr. Biplab Sarkar, MA Lighting Technology Managing Director Gerhard Krude, and Robe lighting CEO Josef Valchar at the GDTF press conference at LDI. There’s no better time for manufacturers to jump on the GDTF bandwagon. If you’re interested in participating, please visit the GDTF website and fill out the form under the “How” section to get involved.